Are you excited for Halo 3: ODST yet? The hype train is rolling right along, and Arstechnica has a great interview with the game's producer Joseph Staten. According to Staten Halo 3: ODST was designed with co-op in mind since day 1. "Every Halo game has been made with co-op in mind. It informs how we build our environments, how we create a scripting system, we have to build an AI that can do with co-op. " "Every one of our missions was tweaked for two or more ODSTs going through the space. We made sure they had different routes to take, different roles to fill. The city is a great place to run around in with four guys." 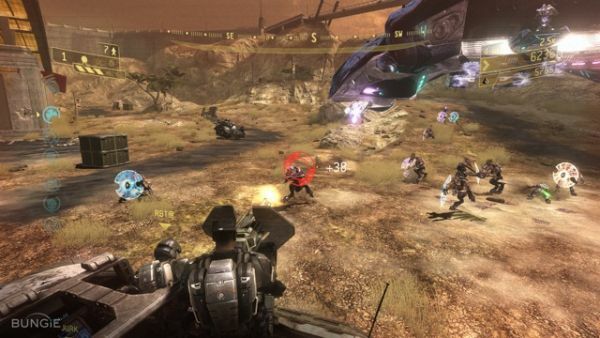 Not only that, the Firefight mode which has been compared to Gears of War's Horde Mode, was originally planned for the original Halo 3. So how is it going to be different and set itself apart from the trend that Gears set? Simple - it's Halo. Halo has its vehicles, its weapons, its systems that have a certain flavor, this will set it apart from the myriad of other Horde Mode clones out there. One other interesting fact about ODST is its development time. In an age when a game can take 3, 4 or even more years to develop; ODST was developed in just one year. Staten attributes that to a "mature engine and development tools" and a clear cut goal. In fact, the team even surprised themselves with how much they could accomplish. This is why the game went from a smaller $40 title to the full fledged $60 title you'll see on the store shelves on September 22nd.